Ian O'Neill does a nice job hosting this week's Carnival of Space at astroENGINE.com. He writes excellent brief descriptions of this week's many posts. I learned a lot before I even started reading the posts! Space Expo 2009 was cool. Almost 1700 people came to the New England Air Museum on a rainy Sunday to participate in some space-related fun and education (and to walk around a great collection of classic airplanes and helicopters). I had planned to give one of the auditorium presentations, but my presentation was bumped when astronaut Catherine "Cady" Coleman (pictured here) told the organizers that she was willing to give her presentation three times. That was fine with me since it gave more visitors a chance to see and hear from someone who has actually flown twice in space (in 1995 and 1999) and is now training for a space station mission in 2010 or 2011. Unfortunately I only got to hear about five minutes of one of Col. Coleman's talks during a very brief lunch break, because I was camped out under the wing of the B-29 giving a non-stop string of briefings to kids eager to try landing the space shuttle in Orbiter. About 70 people (mostly kids, some as young as 5) got to take the stick and try to land Atlantis from short final (my tables were a few feet from another simulator where you could try out the Wright Flyer using realistic controls while lying face down on a simulated wing - quite a contrast!). I also had a second PC hooked up to a projector to show various Orbiter missions - Saturn V launches, Apollo 17 moon landings, shuttle launches, Cassini passes through Saturn's rings, etc. As usual, my visitors were amazed to learn that Orbiter is available as a free download. I had printed a bunch of handouts with Orbiter information and I also pushed my own tutorial book Go Play In Space (also a free download of course) as a way to deal with Orbiter's quite steep learning curve. I was very happy when at the end of the day, Cady Coleman came over to our "hands on demo" hangar and I got to speak with her for a few minutes. I briefly showed her Orbiter and gave her one of my handouts, prompting her to say, "why didn't I know about this?" I also told her a little about the JPL Solar System Ambassador program. Preparing for a post-shuttle space station mission keeps her pretty busy (including trips to Russia and Japan), so I don't expect she will be downloading Orbiter, but maybe she will mention it to some of her educational contacts. Things are happening in space! I need to pack and get some sleep so I can fly home from Taiwan tomorrow! Can I manage to be brief on anything? Maybe if I take on three or four topics? No Fair! Charles Simonyi has already been to the Space Station and now he's launched in another Soyuz spacecraft with a Russian cosmonaut and an American astroanut for a second ISS visit. I haven't even been once! I knew I should have been a billionaire instead of an engineer. But wait, he's an engineer and a billionaire. No fair! Hat trick! Tracking a car-sized Earth-approaching asteroid in space, figuring out where its fragments will land on Earth, and then recovering 47 meteorites from the object in northern Sudan. That's impressive! Nice digs! The video above shows the newly expanded ISS as it looked after Discovery undocked and circled around to inspect their handiwork (30 minutes compressed into 90 seconds). That sort of time acceleration is easy to do in Orbiter, but the fly-around maneuver is not very easy (though it can be done by Shuttle Fleet experts I am sure). Download this! If you'd like to learn more about our wonderful Moon, download Moon 101 - A Course in Lunar Science for non-specialists, ten PDF presentations by Dr. Paul Spudis and other lunar specialists. Great stuff! Orbital Hub is the place to go for the latest edition of the Carnival of Space. There's the usual wide range of spaced-out subject matter, but I especially liked the illustration chosen for Centauri Dreams' post on the prospects for red dwarf "Earths." This illustration was NASA's Astronomy Picture of the Day on May 2, 2007. 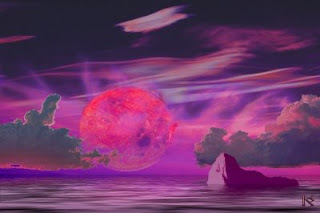 It's artist Karen Wehrstein's impression of sunrise from the surface of Gliese 581c. The Briny Deep... of Mars? 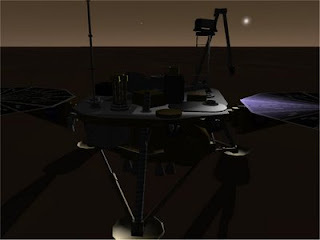 NASA's Mars Phoenix lander froze to death last November, but the data it returned from its polar landing site lives on and may lead to big changes in the way we think about Mars. This report in Science News previews two papers that will be presented next week at the annual Lunar and Planetary Science Conference in The Woodlands, Texas. The titles of the paper are pretty intriguing . "Physical and thermodynamical evidence for liquid water on mars?" (Renno et al) and "Perchlorate in Martian soil: Evidence and implications" (Hecht et al). Of course an ultra-salty perchlorate brine isn't exactly Perrier, but if there turns out to be widespread near-subsurface water, it certainly would change the way we think about Mars, and it could provide a valuable resource for future Mars exploration. I haven't had time to follow the STS-119 mission or much of anything else in the news during this business trip, but I was happy to note that the power system of the ISS is complete and operational. All eight solar arrays are now deployed, with a combined total of 262,400 solar cells producing about 120 kilowatts of power. The added solar panels also make the ISS a much brighter visual object in the night sky. 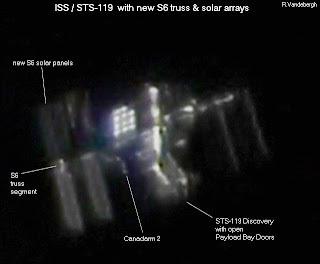 Amateur astronomers have already photographed the expanded ISS with impressive detail as shown in the above photo by Netherlands astronomer Ralf Vandeburgh (courtesy of SpaceWeather.com). When Discovery departs the ISS, they will do the usual fly-around and take pictures of the fully expanded football-field-size space station. Until then, one way to see what this will look like is to use Orbiter with the latest Shuttle Fleet and ISS Fleet add-ons and the STS-119 expansion pack available at Orbit Hangar. I haven't had time to keep up with all the updates, so the picture here is from the Orbit Hangar page for this add-on, courtesy of Dave Hopkins. I spent this past week traveling in China with two Chinese-speaking colleagues, visiting customers and prospects with our distributors in Shenzhen, Guangzhou, Shanghai, and Suzhou. Since presentations and demos in Chinese are understood much better than English, I haven't had much to do in most meetings other than some opening and closing remarks. I've used that extra time to discretely check email on my Blackberry, or to read a book on my iPod Touch. This allowed me to finish James Fallows' wonderful Postcards from Tomorrow Square: Reports from China. Fallows has been a favorite writer of mine for years. I've read many of his articles in The Atlantic as well as several of his books. 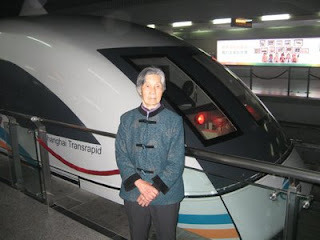 Fallows and his wife lived in Shanghai and Beijing from 2006 to 2008 and also traveled widely around China. This book collects the essays he wrote for The Atlantic during that period. 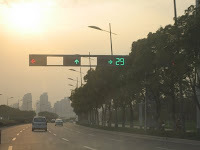 It was cool to be in Shenzhen or Guangzhou while reading his observations about the rapid development of the city of Shenzhen and the hyperactive manufacturing region that surrounds it. Fallows reports on people in many situations, from an Irish expat deal maker who connects overseas companies with Shenzhen-area manufacturers to billionaire business owners to the workers who live in the company dorms and work 12 hour shifts. He actually visits the places he writes about, whether it's a factory or a tiny, impoverished village in far western China. The picture that emerges is extremely multidimensional, as you should expect from a huge country with over 1.3 billion people. Yes, China is centrally controlled, but it is also extremely open in many ways. Yes, it often seems that making money for yourself is the "religion" of China, but there are also people working to help the poorest people in remote western areas. Yes, China's growth is adding CO2 and other pollutants to the environment at a feverish rate, but environmental issues are being taken seriously and they are making real progress (though maybe not fast enough to avert various disasters). This book has really improved my understanding of China's complexities, and it added greatly to the discussions I've had with my Chinese companions this week. 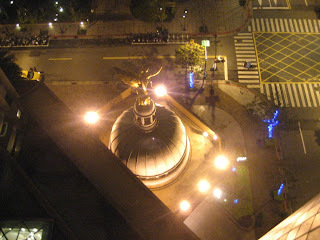 I'm sure I'll get some additional perspectives next week in Taiwan. 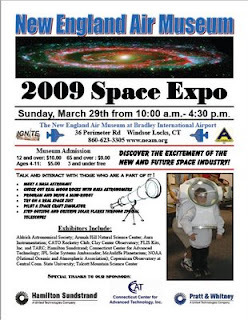 Space Expo 2009 will be held at the New England Air Museum at Bradley International Airport, Windsor Locks, Connecticut, on Sunday, March 29 from 10 am to 4:30 pm. A number of space-related exhibits are planned. 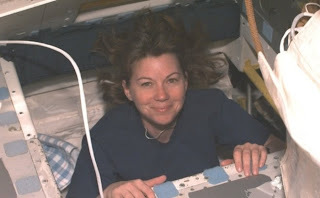 There will be a special guest appearance and presentation by NASA astronaut Cady Coleman. Coleman was selected by NASA in 1992 and flew on space shuttle missions in 1995 and 1999. She is currently training for long duration flight on the International Space Station. As I have done the last two years, I will have an exhibit table at Space Expo 2009 where I will demonstrate the Orbiter space flight simulator and give visitors a chance to try their hand in the final moments of an Apollo (moon) or shuttle (Earth) landing. I will also give an auditorium presentation on exploring space with your computer. It's not what you think. 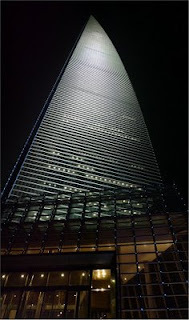 It's just that I had dinner tonight with some Chinese colleagues on the 91st floor of the SFWC Building in Shanghai (that's Shanghai World Financial Center, which also houses the Park Hyatt Shanghai on floors 79 to 93 - I'm not staying there since I hear rooms start at $500). This building opened in August 2008 and at 492 meters and 101 floors, is currently the second tallest building in the world after Taipei 101 (I've been up that one too). From some angles the SFWC looks like a screwdriver or a bottle opener, but from where I was standing, it looked more like a sword with a curving blade. It's illuminated at night and is quite an amazing sight. The views from the restaurant of the tops of nearby buildings were also quite impressive, but the food, not so much, except for the prices. 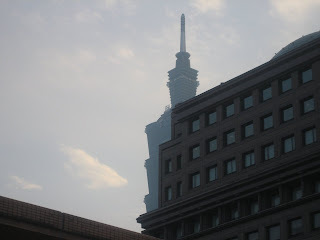 The whole Shanghai skyline is a pretty dizzying sight. Welcome to the future (in some respects). It's official: my Blackberry is now a Crackberry. What changed? My company set up a Blackberry enterprise server so my "normal" email (Outlook on my PC) is finally integrated with my Blackberry email. Before this I could understand in theory how people like President Obama and millions of others could love their Blackberry's so much, but mine just felt like a clunky cell phone with a keyboard. It's still clunky compared to the iPod Touch, but the interface is less important than the immediacy and the ability to use odd bits of time (e.g., while stuck in a huge traffic jam in Guangzhou this morning) to deal with simple emails that just require a brief message to ask or answer a question or to hand off to someone else. I save the bigger issues (and attachments) for when I can access the PC. So now I'm one of those people you see turning on their Blackberry the moment the plane touches down, furiously rolling the track ball and thumbing the tiny keyboard. Yeah, it's pretty sick, but believe me, I can quit any time. I'm in Shanghai for the next few days. Driving through the city after dark with a crazed taxi driver tonight, I was struck by how much this city resembles the movie Blade Runner, though they don't have flying taxis (yet). Just thirty years ago, Shenzhen was a basically a fishing town near Hong Kong. 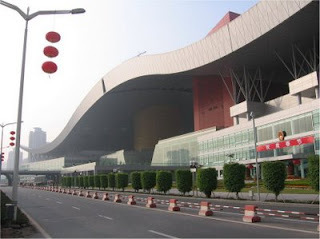 Then it was designated a special economic zone by the Chinese government. Factory complexes and office buildings sprouted like weeds and now they have 10 million people. But since it's a recently planned city, it feels different from any Chinese city I've every visited - streets are wide and seem less chaotic because there are virtually no bicycles and hardly any scooters (I've mostly been driven on just a few main streets). So it's all new, and while it's mostly typical looking office, factory, and apartment buildings, they do have some pretty amazing architecture here and there. The Shenzhen City Hall shown here is especially striking. The nearby library and concert hall are also quite beautiful. This week's Carnival of Space host and "lunar librarian" Ken Murphy pointed out a cool Moon-related freebie this week. Moonwake (free PDF download) is a "juvenile" science fiction novel by Anne and Paul Spudis. I haven't read it yet, but Ken gave it a great review in its original book form in 2006. Checking further on the web site of Dr. Paul Spudis, I found that it's a terrific resource on all things lunar. Dr. Spudis is a planetary geologist at the Lunar and Planetary Institute in Houston. His lunar experience is pretty impressive. 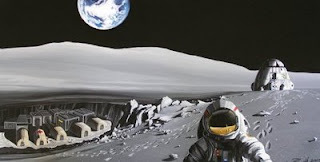 He also has a blog, The Once and Future Moon, which is now hosted by Air & Space Magazine. 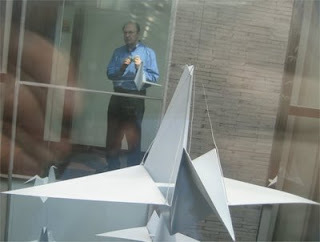 His blog in turn pointed me to a new space-related blog also at Air & Space, The Daily Planet. 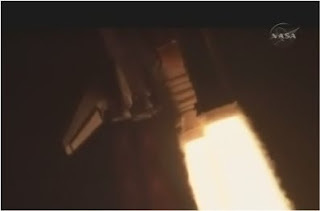 It's amazing to me that from my hotel room in Shenzhen, China on Monday morning, I could watch the Sunday evening launch of the shuttle Discovery live on NASA TV. 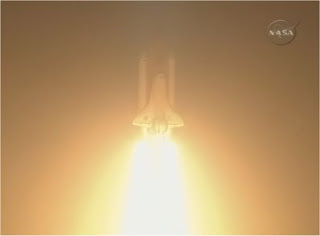 It's not as spectacular on a tiny PC video window with tiny PC speakers, but it's still pretty spectacular and brings back memories of the one shuttle launch I got to attend at KSC in the summer 2007. The STS-119 crew will deliver the S6 power truss, the last major power-related component of the ISS. The ninety-fourth Carnival of Space is available at Out of the Cradle. Ken presents posts from twenty bloggers this week (unfortunately not including me as I was too busy getting ready for the trip I am on at the moment). 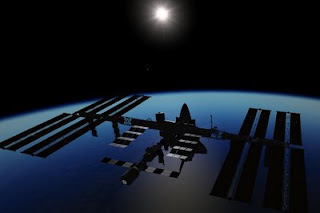 One post that caught my eye concerns the possible launch of a Chinese space station in 2010. Since I'm in China, I thought I would check that out, but the link is unavailable to me, possibly trapped by the Great Chinese Fire Wall. Other than that, I haven't noticed any blocked sites. 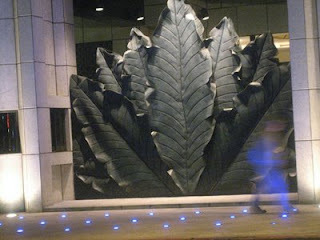 My blog and others I have tried have been available, as is Wikipedia, so it's more open than on my last trip to China. I always "overbook" on books for long trips. I'm still carrying a couple of "emergency" paperbacks, but with eReader and now the Kindle Reader on my iPod Touch, I can carry zillions of pages of reading matter with only a few electrons worth of weight penalty. I just need the time and the battery life to read them. I bought a couple of Kindle books including a book of essays on China by James Fallows, a favorite writer (Postcards from Tomorrow Square) - this meets my geographically related requirement. But mostly I sought out free books to fill my Kindle home page, and there were a few interesting ones even outside the public domain classics category . I usually don't do "fantasy" but one of the free current books was His Majesty's Dragon. It had great reviews so I downloaded it. It's sort of "alternate history fantasy" in a world where (talking) dragons exist and have been pressed into service to carry pilots and provide air support during the Napoleonic Wars! Sounds crazy, but I started reading it, and I think I'm hooked. I keep going back to it so I think this will be my first book for this trip, jumping the stack as usually happens. Serendipity rocks. Update: I read His Majesty's Dragon on the long flight from Chicago to Hong Kong. Great book! Who cares about genre? This is just a great story with great characters, some of whom happen to be talking dragons. I read somewhere that Peter Jackson ("Lord of the Rings") bought the movie rights to this series - I hope it makes it to the screen. Meanwhile there are at least two sequels that I'll probably buy and read sometime (but not on this trip - too many others in the queue) . The free first book thing is good marketing. I just discovered two windows into the future. One is serious but often funny, a TED talk by Juan Enriquez called "Beyond the crisis, mindboggling science and the arrival of Homo evolutis." This is from a very recent TED conference (February 20, 2009) and provides some interesting big picture views on the economy (with hilarious visuals), followed by some thoughts on where we are headed with developments in cell engineering, tissue engineering, and robot engineering. The clip of the robot mule is somehow a bit creepy, like a Dali painting come to (robotic) life. The other discovery is funny but somehow serious, the music of the comedy duo Flight of the Conchords. They are not new, but somehow I never heard any of their stuff (nor saw any of their HBO series, though I see now that the second season just started on January 18, so I'm not as far behind as I thought). Their satirical songs are not only outrageously funny, they are musically quite good, and their song and video "Robots" somehow connects with Enriquez's TED lecture. You can find a lot of Conchords videos on YouTube. I probably will not be blogging much the next couple of weeks. The last time I was in China, Blogger was blocked by the Chinese government content filters (oddly enough I could access the Blogspot editor, so I could edit but not view my blog). I'm not sure if Blogger will be available this time or not - I hear these things come and go depending on what certain political bloggers say about China. But I shall return. Lots of stuff going on - big Asian trip coming up soon, and things are crazy busy at work, so it's hard to get any mind share or creative energy for blogging (plus I've been putting whatever creative energy I can muster into writing new music). But this is something I've been planning to mention for a while so I'll just say a few words for now. 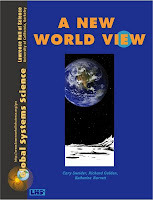 A New World View introduces the GSS central concept of Earth systems in which everything is connected to everything else. It shows how the Earth has tremendously diverse environments, yet is a single planet that we all call "home." Includes focus on forests and an investigation of life inside a terrarium. This series comes from the University of California at Berkeley, and it's really great. Since I bought the series on CD in December (PDF version), I've been reading various chapters for fun. They are interesting, clearly written, but never "dumbed down" - the authors assume that readers are concerned and curious citizens of the Earth, and just possibly in high school. Note: If you order the books and/or CD, you may be eligible for downloadable upgrades, though I'm not sure this applies now that the 2009 editions are available. I bought an earlier version of the CD and was able to download the 2009 versions. They do have extensive web links and other materials to update the books based on current events and scientific developments. They also have teacher guides for all and related software for some of the books in the series. You can also download the teacher guides and free sample chapters here. 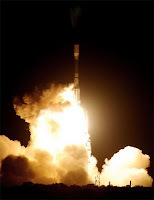 Carnival of Space #93 is hosted this week by the Planetary Society Blog. Emily Lakdawalla points out that a carnival is certainly in order on the occasion of the successful launch of NASA's Kepler planet-hunting spacecraft last night (shown here). She also points out that the Planetery Society has recently launched its own contribution to exoplanet studies with its Catalog of Exoplanets. It boggles the mind to think that we already know about enough exoplanets that we actually need a database for them! Kepler could add a number of Earth-size exoplanets to that list in the coming months. I wrote a post about Kepler's search strategy about a year ago ("Staring at the Suns"). Exoplanets are cool, but this week's carnival is not all about exoplanets - there are posts on comets, the moon, future technologies, supernovae, and much more. Check it out. iPod Kindle and Free "Red Mars"
I've jumped on the Amazon Kindle bandwagon without having to buy a Kindle. That's because Amazon has released its free "Kindle for iPhone" application which also works on the iPod Touch. I downloaded and installed the app (it actually caused iTunes to lock up twice, so I ended up downloading it from the iTunes Store on the iPod itself via wifi). It's similar in operation to the eReader application I've used to read various short stories and a few books on the iPod, though it's simpler (and maybe buggier) than eReader. I try to avoid 1.0 software but I was anxious to try this. Then I needed something to read with it, so I searched through the many free books (mostly older, public domain stuff) and downloaded a couple of works on Darwin by T.H. Huxley (from late 19th century). Continuing with Darwin for some reason, I found a historical novel called Darwin's Dreams by Sean Hoade. It's a fact-based but fictional account of Darwin's "Beagle" years, and it had a couple of good reviews, so for $3.99 for the Kindle edition, I bought it (via the Safari browser on the iPod). In a few seconds it showed up on my Kindle home page. Cool. I browsed some more and found a book I had been meaning to buy and read sometime, Anathem by Neal Stephenson. I love Stephenson's writing, but his books are huge and not very travel friendly (Anathem is 960 pages). Not a problem with Kindle on the iPod (but 16,000 iPod size pages is a lot of flicking). This book was the typical best seller or recent book price of $9.99, but considering that Anathem is still only in hard cover for $20 on Amazon (paperback due in August), it's not too bad. And very portable. That should have satisfied my need for "something to read" on the Kindle app, but I kept searching and found something unexpectedly good and free, Red Mars by Kim Stanley Robinson. Not sure why it's free (loss leader? ), but it's a great book I will be happy to re-read sometime, and now I've got it in my portable library. So all I need is time, which an upcoming trip to Hong Kong, China, and Taiwan will soon provide. Reading on the iPod is really pretty comfortable, and I just confirmed that I can play music and simultaneously read with the Kindle app. So I'll have plenty of light weight reading material for my Asia trip, though I will still carry a few paperbacks for backup. Thanks to Bad Astronomy for pointing out this high quality footage taken from a 16 mm color movie camera as Neil Armstrong was descending the LM ladder and taking his first steps on the lunar surface on July 20, 1969. Very cool. The video is from tviscool.com. The main sections are "Astronomy of Earth's Motion in Space" (including a recently added section on the solar system), "Newtonian Mechanics" (with a great optional section on spaceflight to Mars), "The Sun and Related Physics," and "Spaceflight and Spacecraft." There's even a math refresher section and a timeline. This is a great resource for teachers or informal educators as well as for student projects.